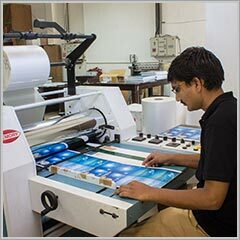 Complementing our pre-press and printing services, we have the latest technology for post-press services too, like Heidelberg Stahfolder (Germany), Thermal Lamination Machine (China), etc. Whatever the project, our team of experts guarantee highest standards of finishing operations as well. Shrink and stretch wrapping, etc. We ensure that we understand your requirements and develop bright ideas and practical solutions achieving excellence at every step.